This is the holy grail, it’s what every golfer wants to be able to do. Spin the golf ball on the green. 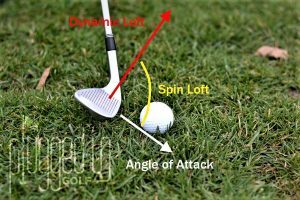 Now, if you read my blog two weeks ago you would have a brief understanding of what “spin loft” is, if not then it’s basically the angle between your attack angle and your dynamic loft. To learn more, take a look at my last top tip blog. So just to recap, to maximise distance we want to make the “spin loft” number very low. However, when we are talking about maximising spin on the golf ball, we need to do the opposite and make the number as big as possible. So by now, you’re probably thinking how can I do this? There is one more vector we need to include to maximise spin and that is “club path“. If we can increase our angle of attack to make it steeper, make our club path out to in, whilst increasing our dynamic loft - Basically, if we can separate these 3 vectors as much as possible, that will maximise spin. Let’s break that down into simple steps for you test out on the range/course, so you can see the proof. - Then make a confident swing through the ball, whilst maintaining the weight forward the whole time. If you follow these four steps, then the three vectors will be much further apart and will therefore have a bigger “spin loft” number. There are other ways of increasing spin loft, however, this is the first key simple way to do so. If this doesn’t give you more spin or your struggling to understand. Then book in a 45 minute golf lesson with myself and we can go through some things and get you maximising your spin rates. If you wish to learn more then call me on 01983 613131 and book yourself in for a golf lesson.